Water maker, 9 GPH 8 KW generator, 1,550 hrs, Fischer Panda High output alternators on engines Hard Top over entire cockpit area. 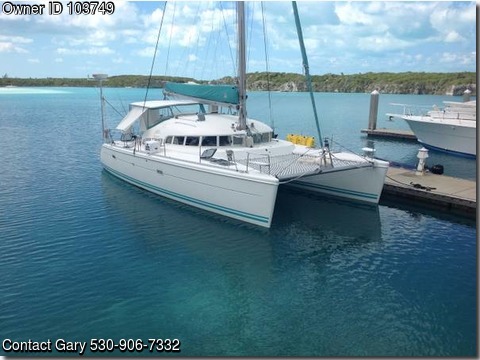 480 Watts Solar, 4 new AGM house battery's 2016 Washer Dryer combo LED underwater lights OceanAir premium sun shades and screens 3 air conditioners, one unit new 2017, one unit new 2016. New Dodger, shade screens Engines: Yanmar 38 Hp, Port 430 Hrs. Engines maintained by Yanmar Dealer. New 9'8" tender with 20 hp Yamaha New Raymarine eS 128 MFD with WiFi so you can monitor the boat from your iPad anywhere on the boat. New Raymarine HD color Radar, 48 mile range. overlays on MFD and iPad Max-Props, automatic feathering propellers Xantrex Invert-er and controller, SSB, VHF, ICOM radios Cell and WiFi booster (works great in the Bahamas) New premium bottom paint Nov 2016 Boat is in excellent condition, You have to see this boat, if your in the market for an affordable Cat!